Our Polishing Filter Pad’s dense fiber network traps large to very fine particles floating in your freshwater or saltwater aquarium to produce sparkling clear water. Its durable design allows this pad to be cleaned and reused many times. Place our polishing pad in the path of flowing water to trap floating debris from the water. This filter pad is very efficient at trapping very fine particles, so please clean the pad regularly. This pad can be used alone or layered with other filter pads such as our Classic or Premium filter pads to extend cleaning time. Make A Template - Since pads need to be replaced on a regular basis, a cardboard template can be made in the shape and size of the filter pad you are replacing. Use a sharp pair of scissors to easily cut the filter pad to your desired shape and size. Safe From The Bag - After you have cut out your desired shape and size your pad is ready to be used in your filter. When a new polishing pad is placed into a filter they look great. But over time they begin to trap floating particulates from your water. As these particles are trapped, the filter pad will clog up and need to be replaced or cleaned. The cleaning methods shared here are for polishing pads used only as a mechanical filter to trap floating debris from the water and not as a media to grow beneficial bacteria. Clean our polishing pad by rinsing it in fresh water, wring out and repeat this process until the water runs clean. If you ever need to deep clean our polishing pads they are durable enough to be cleaned in a washing machine. Since this method uses a washing machine, it may be more efficient to collect several filter pads [from previous changes] before using it. Optional - run your washer in a hot rinse cycle to remove all soap residue (normally only necessary in older machines). Use 3 capfuls (teaspoons) dye- and fragrance-free bleach (Sodium hypochlorite with no additives). 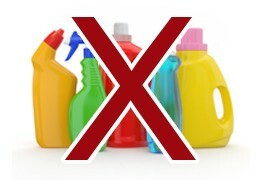 DO NOT Use OxiClean, laundry detergent, or any other soap product. Add an extra rinse cycle at the end of the wash to ensure the bleach is removed. After you remove pads from the washer they may still have a hint of bleach smell. Should you need socks sooner - place them in a bucket with 2 gallons of water with 1/5 teaspoon of Aquatic Experts Premium Complete Water Conditioner or similar chlorine remover for 30 minutes. Polishing pads can be dried in a clothes dryer but USE LOW HEAT ONLY! Obviously no fabric softeners or anything else. Q. Which side of your polishing pad should the water go through first? A. If both sides of the felt pad are soft to the touch then water will flow equally well through either side therefore it does not matter which side goes up. However, if one side of the felt pad feels rough to the touch it has been heat treated to keep fibers from migrating or pilling after cleaning. When using this felt pad it is best for the water to flow through the soft felt side first. Q. Does the 50 or 100 micron polishing pad trap the finer stuff from my aquarium water? A. The smaller the number of microns, the smaller the holes in the polishing pad. 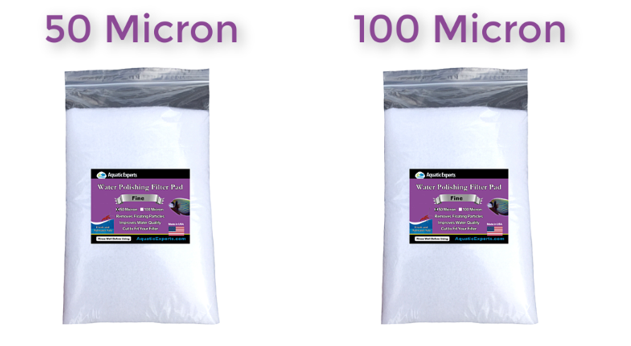 In this case, the 50 micron will trap much finer particles than the 100 micron.